Persian Chickpea Cookies are buttery soft, melt-in-your-mouth, gluten free cookies that are flavored with cardamom and taste fantastic. They are so easy to make and will absolutely win you over! 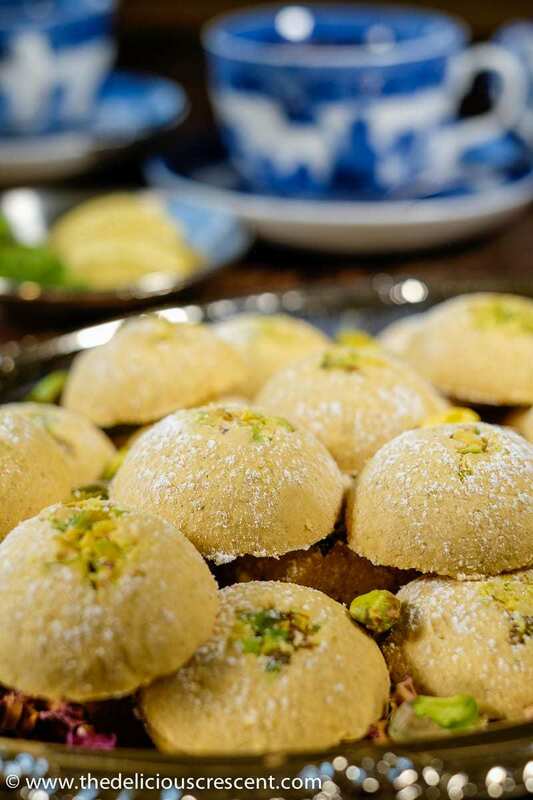 These cardamom chickpea cookies with pistachios are a mouth watering Persian treat, traditionally known as Nan-e Nokhodchi. They are quiet similar to some Indian sweets prepared with the same ingredients. I think that using ghee (clarified butter) gives these cookies a nice nutty and rich flavor. You could always make it with only oil too, for a vegan version. Specifically light olive oil, which does not have an intense flavor. ARE CHICKPEA COOKIES GOOD FOR YOU? Chickpea cookies are gluten free. With the rising occurrence of gluten allergies and other conditions requiring a gluten free diet, there is always a need for gluten free recipes. So this would be a great cookie option for that. Also, chickpea flour has more fiber and protein compared to all purpose flour, which is commonly used for making cookies. It is essential to use “roasted” chickpea flour and not the regular raw chickpea flour because it makes a world of difference. The sifted and roasted chickpea flour gives these cookies that incredible sandy and crumbly texture. If roasted chickpea flour is not easily available, you may purchase roasted chickpeas from Indian, middle eastern, Mediterranean or other ethnic stores and process it into a flour. The sugar contributes to the required texture for the cookies. And I have given a range for the quantity of sugar for this recipe, but the lower end is sweet enough. Yes, it has the sugar and ghee, but a sweet is meant to be enjoyed occasionally in small quantities. That is why it is called a treat. Here is one more decadent treat for you to try – Tahini Orange Chocolate Marble Cake. If you want a chickpea cookie that is made with chickpea flour then this is the recipe for you. 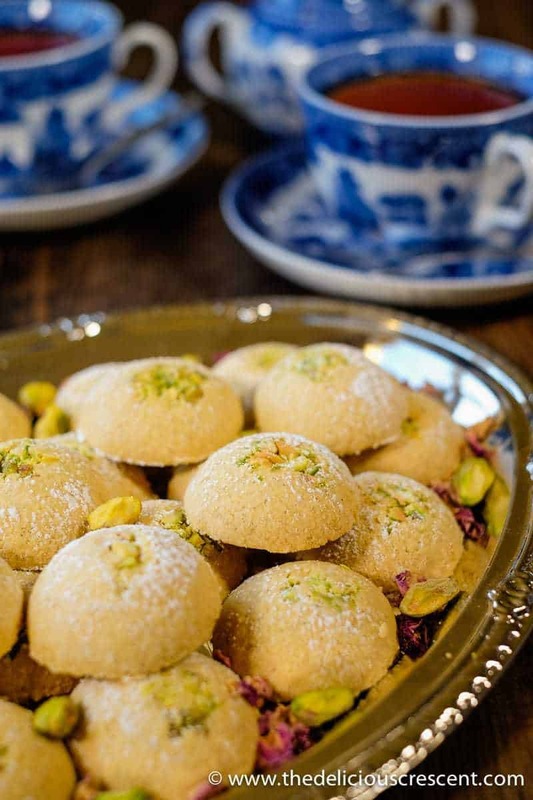 Now brew a cup of tea or coffee and relish these melt in the mouth Persian Chickpea Cookies! If you prefer, you may lower the sugar to 1/2 cup and increase the chickpea flour to 2¼ cups. The cookies will be slightly less sweet but still tasty. Make sure that the ghee is melted well. If it thickens, melt it again but it should not be hot. 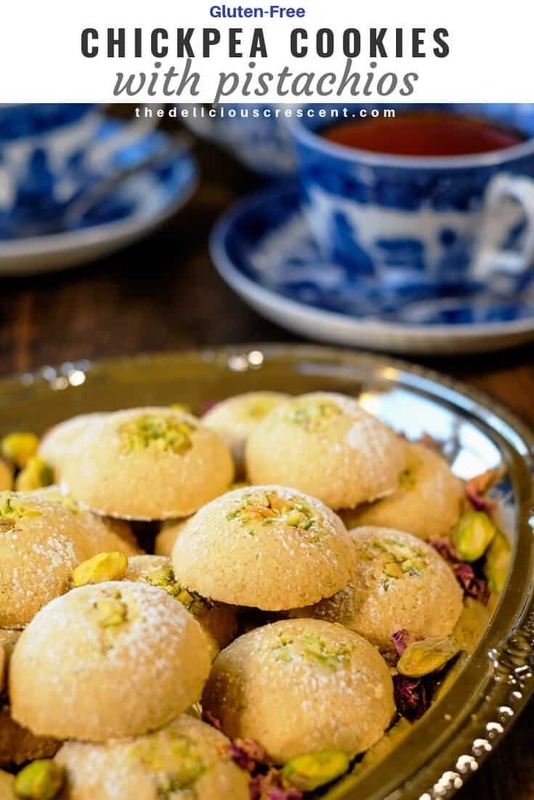 These Persian chickpea cookies can be frozen in an airtight container and stored for a month. Ready made ghee is available in Indian grocery stores or online. But it can be easily prepared at home. To prepare ghee, melt unsalted butter and allow it to simmer at a low setting. Allow the milk solids settled at the bottom of the pan to toast to a light brown. Strain the light golden liquid ghee from the top. Roasted chickpea flour is available at some Persian/Middle eastern/Mediterranean/Indian stores or online. These Persian Chickpea Cookies are buttery soft, melt-in-your-mouth, gluten free cookies that are flavored with cardamom and taste fantastic. They are so easy to make and will absolutely win you over! Traditionally also known as Nan-e Nokhodchi. Combine the melted ghee, oil, sugar, cardamom, rose water and salt. Then add the roasted chickpea flour and mix well. (You can also make your own flour by processing the roasted chickpeas in a Vitamix or a food processor). The dough may be a bit crumbly or dry but it works. Take a smooth stainless steel tablespoon measure to shape the cookies. Place a few pieces of pistachios in the center of the tablespoon measure. Next fill up the tablespoon with the dough and pack it really well using your fingers. 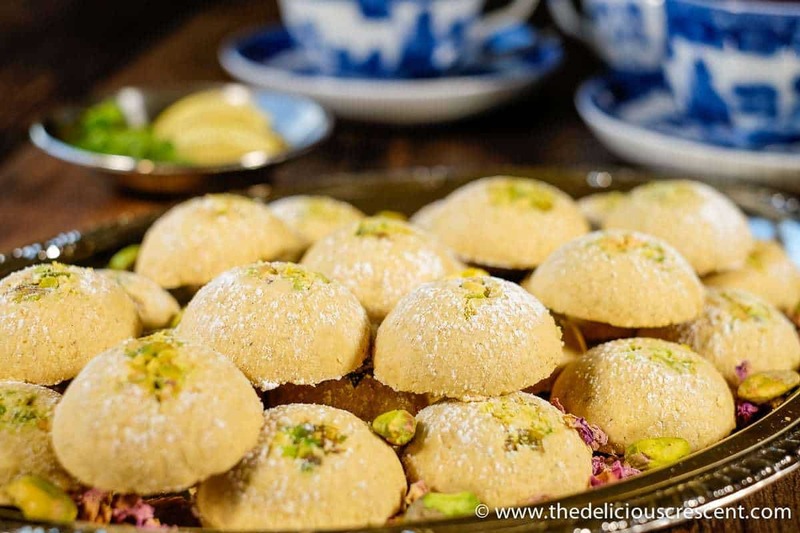 Carefully scoop out the cookie dough and place it on a parchment lined baking sheet, with the circular side and pistachios facing up. Make sure to space the cookies at least one inch apart. Bake for about 14 to 18 minutes until slightly golden brown. You will notice a delicate cracking on the surface when the cookies are well baked. Remove the baking sheet from the oven and allow the cookies to cool very well. Carefully transfer the cookies to a serving platter or storage container. 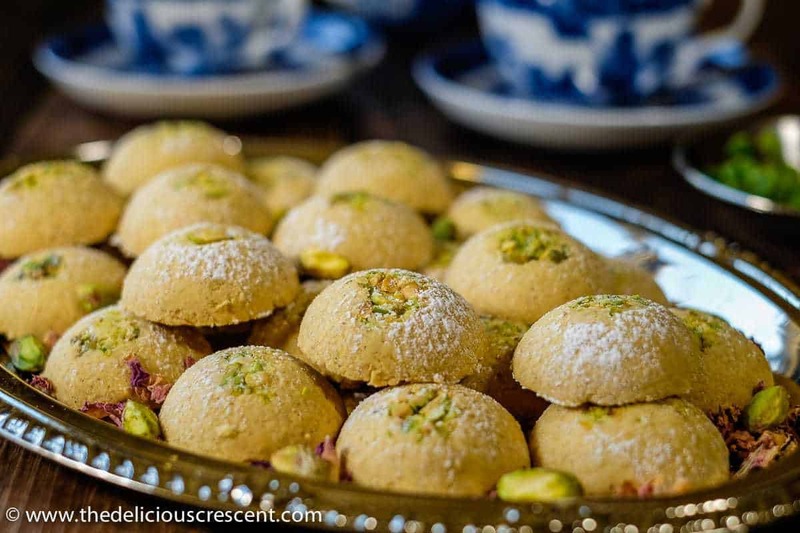 Enjoy the Chickpea Cookies with Pistachios. Readymade ghee is available in Indian grocery stores or online. But it can be easily prepared at home. Roasted chickpea flour is available at some Persian/Middle eastern/Indian stores or online. Hi Donna. So happy that you liked it :) These traditional cookies are more crumbly and delicate than most other cookies. However, they can be easily stored in boxes. I do that all the time. They are very crumbly right out of the oven. I cool the cookies completely for a while and then they are firmer. I use a combination of oil and butter or ghee. But using only butter or ghee and then letting it cool completely would perhaps make it a bit firmer. 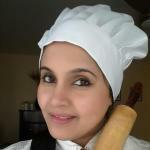 You may have to increase the amount of butter or ghee slightly to make a dough that is easy to work with. Also the ingredients are in US measures. I have to update it to metric measures. Hi Donna. You are very welcome. Thank you. I have updated the metric measures too. Wish you a wonderful time with your family and friends.